Thanks for the entries for the competition. 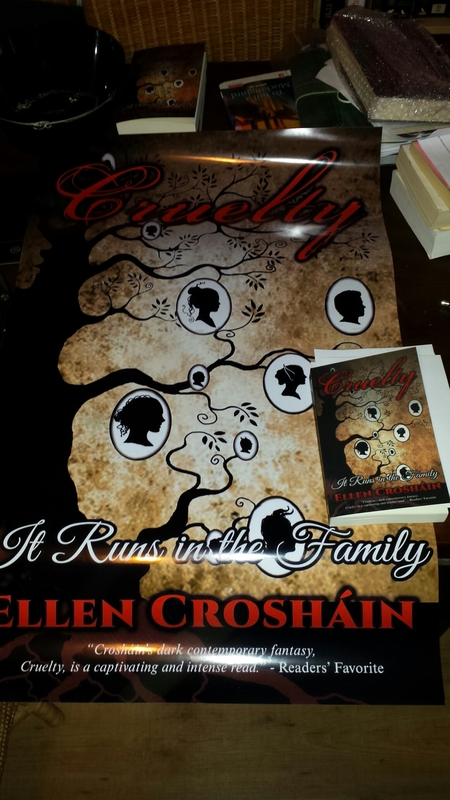 The winner is…CN Lesley whose favourite character was The Cruel ‘who got a raw deal and handled himself well in a range of situations.’ PM me your details and the poster will be making its way to you asap. I haven’t done a blog in aaaaages and I do apologise. Things have been stupidly hectic at ordinary job (we have an Estyn inspection soon so it’s been all hands on deck) and with getting things ready for Peanut. I have been doing very little writing recently but in two weeks, the inspection will be over and I will have a little more free time before Peanut gets here. My poor characters have been stuck in limbo for some time so I made sure I completed my story arc notes so they would at least have some semblance of order. If you would like to win this (signed of course) all you have to do is tell me who your favourite character from the book was, and why, by May 16th. Leave me a message on my blog, on my Facebook page or via Twitter @EllenCroshain. The winner will be selected on the 16th and the poster will be sent within a few working days.